With its unique ergonomic design, the VerticalMouse minimizes reach and motion to combat repetitive strain injuries. The Evoluent VerticalMouse C Right Wireless ($109.95) was designed combat repetitive strain injury (RSI) and other shoulder-arm-hand discomforts, at least for the 90 percent of us that are right-hand dominant. The company claims the palm-down position used to operate conventional mice twists your forearm and puts you at risk of injury over time. The VerticalMouse C Right Wireless puts your arm in the more “neutral”—and presumably safer—handshake grip position. I have to admit I couldn’t find any data to support this idea, though, and easily found plenty to contradict it. By most expert-y accounts, the handshake grip is not a neutral position and the proper hand and wrist Position for using a mouse is, in fact, pretty much the one Evoluent claims is the problem. The VerticalMouse C Right Wireless puts your arm in the handshake position. But that doesn’t mean there aren’t things to like about this mouse. First, is the sleek, supportive design. From the side the mouse’s contoured body looks a lot like a dorsal fin as you’d see it cutting through some waves. 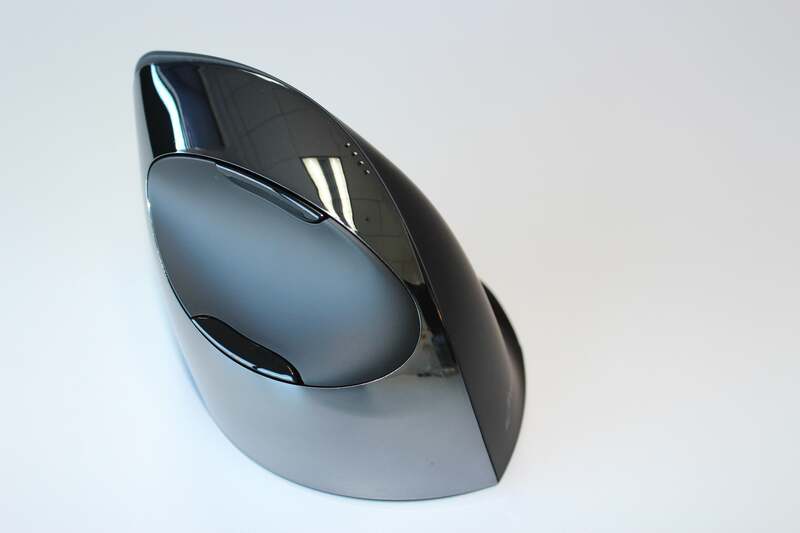 Most of the inner half has glossy, reflective surface save for a cutaway portion that cradles your thumb. In this little nook are two function buttons, one above your thumb and one below. The outer side is done in matte black and integrates three finger-sized buttons that correspond to your index, middle, and ring finger. A lip extends from the bottom to support your pinky. A scroll wheel is inset between where your top two fingers go, and just behind it is a button for adjusting the pointer speed. Four LEDs on top of the mouse indicate the current pointer speed from low to high. 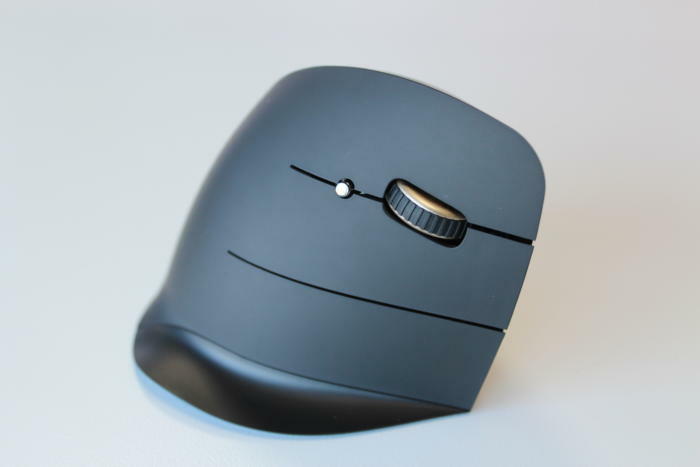 Once you get the VerticalMouse C in your hand, the method to Evoluent’s madness becomes clear. Every single mouse control is placed within a finger-flick’s distance, so that you never have to change your grip. Operating the VerticalMouse C felt very natural, and though I expected the vertical hand position to make me prone to squeezing the mouse, particularly when pressing one of the buttons, my hand was actually more relaxed. It helped that the buttons were responsive to minimal pressure and the mouse tracked smoothly on most tabletop surfaces. I even used it on my couch cushion, and it glided like skates on ice. Downloading Evoluent’s optional Mouse Manager software allows you to configure the buttons to perform tasks that normally require you to move the mouse, such as cycling through browser tabs or closing windows, further minimizing repetitive arm motion. In addition to the mouse button’s five primary functions, one of the thumb buttons can be set to function as a modifier in conjunction with any of the other buttons to perform secondary functions. 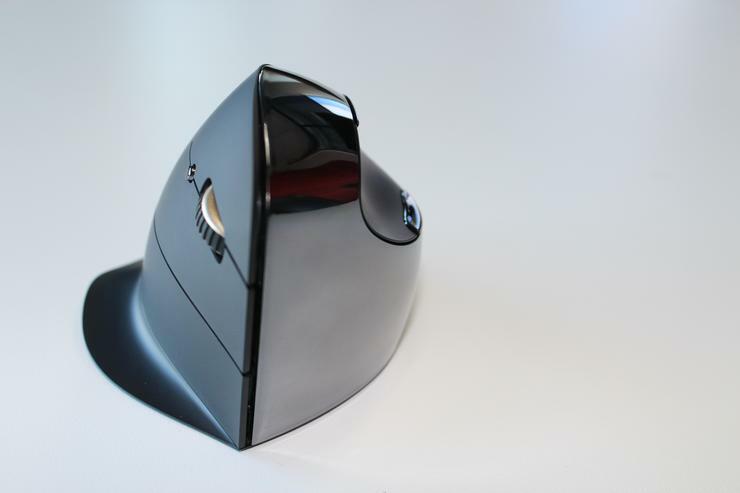 The Evoluent VerticalMouse C Right Wireless is a comfortable, responsive mouse for common computing tasks. I can’t vouch for the science behind it—RSI is a complex syndrome with many contributing factors, most of which aren’t directly attributable to the design of your mouse. Nevertheless, I did find it more comfortable to use than either a laptop’s trackpad or a conventional mouse. If you suffer from RSI, there’s little risk in seeing if it helps your condition—Evoluent offers a 30-day money-back guarantee on products purchased directly from the company. You may see greater results by pairing the VerticalMouse C Wireless with Evoluent’s Reduced Reach Right-Hand Keyboard, which reduces the range across which you have to reach for your mouse—a factor that has been implicated in RSI.